Heavy rock rolled back to 118 W. Holly Street in February, where it was welcomed with open arms. Sean McKee, new co-owner of Boscoe’s (which replaced Swillery Whiskey Bar, which replaced Tubbs) is making good on his promise to turn the location into a full-time, cover-free venue. 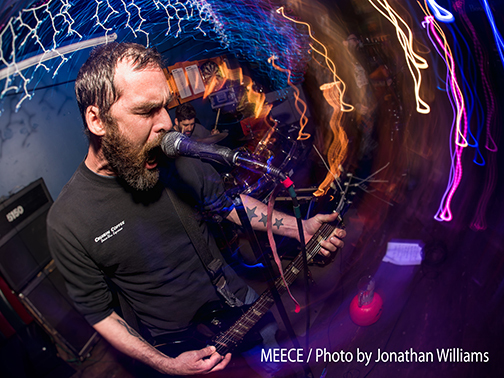 Launching the space into this new direction Feb. 10 was the newly-remodeled bar’s first full, live, band-driven show, featuring Meece and Ludovico. Bellingham power-trio Meece set the evening’s tone by overwhelming the narrow, intimate space with four amplifiers, a drum kit, and two grown men seemingly trying to out-scream each other (it was a tie). They played mostly original music, the exception being a cover of legendary punk band Descendents’ “Suburban Home,” which is mainly worth mentioning to note that they did it justice. Traveling up from Arlington and Lakewood, Ludovico followed suit, closing the show with some noise of their own. Correction: “noise” is the inappropriate word. Considering the quality, character, and borderline orchestral nature of Ludovico’s sound, the three have obviously spent serious time and energy honing their individual skills to artisan levels. That sound, however, is by no means gentle. The crowd responded to what Ludovico had to offer with screams, sweat, drinking, and dancing—and those are just observations of Ludovico singer/guitarist Conrad Gruener’s dad. Standing out in particular was drummer Jay Scheeler, who makes ungodly speed and precision look unbelievably easy. Indeed, the word is he’s been hired on as a session drummer by the studio where the group records. Both groups played so well and so loudly that I didn’t notice my ears ringing until I stepped outside and, distracted by lingering sound, promptly fumbled my way off a curb. Give either group a listen; you won’t be disappointed. See Meece play again at The Waterfront March 3 as part of the What’s Up! 20th anniversary series of shows taking place all over Bellingham. Every month there are shows in town that can be labeled as “can’t miss” and for this reviewer, there was no way Heron Oblivion and The Thurston Moore Group could be missed. Two bands that include members who have pushed the sonic envelope over the years, this show was going to be heaven for space, noise and cool music. Heron Oblivion opened the show playing songs off of their self titled Sup Pop debut. The band, which includes Ethan Miller (Comets on Fire, Howlin’ Rain and Feral Ohms), Noel Von Harmonson (Comets on Fire, Sic Alps, Six Organs of Admittance), Meg Baird (Espers) and Charlie Saufley (Assembled Head in Sunburst Sound), is a Bay Area psych super group of sorts with each member holding a legendary status and that showed in their set. These four musicians are such masters of their craft, their songs flowed with a beautifully haunting textured delight. Throughout the set, guitarists Noel and Charlie played bouncing off of each while never getting in each other’s way – exploring, at times, simple note arrangements and sounds with an understated warmth and psychedelic elegance. Drummer Meg pushed the songs with beautiful and spacious drumming while her vocals angelically floated over the top – all the while, Ethan, who is an incredible guitarist in his own right, played as the perfect sonic bridge between all the instruments. Throughout the 45+ minute set, the audience was mesmerized, almost awestruck by what they were seeing. As the the final notes rang out, the audience gave a rousing round of applause – thankful for what they’d just seen while excited for what was to come. After the break between bands – a little bit longer than normal as there were only two bands, The Thurston Moore Group came on stage to overwhelming excitement from the crowd. For many in the audience, a large portion of whom were in their 30s and 40s, this was akin to seeing God 20 feet away. The band, which includes Thurston as well as Steve Shelley (drums) from Sonic Youth, Debbie Googe (bass) from My Bloody Valentine, and James Sedwards on guitar, went straight into songs off of Rock N Roll Consciousness which was released last year. Over the next hour plus, the band played a set you’d expect from some of the most brilliant, innovative and seasoned veterans in underground/indie music; they took the crowd for a ride, pushing, pulling and exploring different sounds and sonic structures. About three quarters of the way through the set, The Thurston Moore Group descended into noise and reserved chaos, layering feedback over improvised guitar – it was the type of magic you’d expect from the band. After the waves of feedback ended, they played a few more songs and the show was over. Just like that, an incredible night of music had ended just as so many had in the past. With the line-up, there was no doubt this would be a great show. Local band Motus never fails to deliver and I was curious to see what the Polyrhythmics could bring knowing that they had a member that is a Bellingham native. It was so awesome to walk into the Wild Buffalo and immediately see Motus on stage. I could instantly feel the vibrancy coming from the stage and wanted to get closer. The venue was already getting pretty crowded but the place kept filling up. Everyone there was definitely in for a good time – both bands can bring some serious heat. Motus’s soulful energy lit up the whole room. The R&B rhythm and percussion with jazzy strings and horns got people dancing. The guitar was especially funky in this performance; Motus definitely picked up on how they much moved the crowd. The members in Motus were equally having a good time, whether it was dancing or jumping to the music, goofing off, playfully wowing the crowd with a spontaneous solo, or simply losing themselves in the music and closing their eyes. Their playing got faster, and more confident throughout the set; they took more risks the more the audience danced or cheered. The risks definitely worked out in their favor because everyone had fallen in love with Motus by the end of their set. The crowd chanted for an encore. The Polyrhythmics came onto the stage with an already very pleased crowd and went right into it with “Cactus Blossom.” Starting with just keys, the bass then made its way in there, and once the drums kicked in everyone’s dancing kicked in too. Each time a new instrument was introduced, I heard “ohhs” and “ahhs.” This was a perfect song to start with because it let each member’s sound shine on their own before blending together. Every song sounded pretty true to its recorded version and the energy every single member brought made the performance a treasure to experience. You could tell the Polyrhythmics were in their element up there. They jammed hard the whole time, not stopping once for a breath. I was convinced Nathan Spicer had at least 100 fingers because he made fast keyboard playing with one hand look effortless. I never saw Grant Schroff (drums) put his drumsticks down once. The percussionist, Karl Olson, is from Bellingham and has worked with local bands such as Polecat and Umami. It was truly sweet to see him on stage with a visiting band. His solos and rhythm helped carry the groove excellently. The audience didn’t stop dancing throughout the whole set either. Everywhere I looked, there were couples, friends, and family alike laughing or moving together. Without any vocals, it was easier to transition into each song without missing a beat. Without any pauses and with how funky the music was, it wasn’t a challenge for me to also lose myself into the music. I could feel each beat dance its way through my body. By the end of the show, everyone appeared more than satisfied by having their dancing desires fulfilled. As the crowd poured out the door, each and every person was grinning from ear to ear and boasting about the show. The audience came to the Wild Buffalo to get funky and the funk was more than delivered. It was the middle of February and there’s another sold out show at the Wild Buffalo. Regrettably, I had missed the memo about the early start time and therefore arrived right as opening act Eminence Ensemble was wrapping up around 9:30 p.m.
Hailing from Boulder, Colorado, this rock and soul sextet is out on a whirlwind national tour in support of Matisyahu. Everyone I spoke with enjoyed their high energy show and many referred to their cover of the Allman Brothers’ “Whipping Post” as a high point in the set. After a quick reset of the stage, Matisyahu and his band came out right at 10 p.m. A good portion of the bar was closed or barricaded to allow for certain lighting and sound needs, including the entire upstairs, so the room was absolutely packed full, making it impossible to dance but concentrating the energy. Since his first album release in 2004, Matisyahu has become world renowned for his signature sound, orthodox Jewish and Old Testament themed lyrics, as well as top notch beatboxing. He began his career performing shows in full traditional Hasidic garb and refused to play shows after sunset on the Sabbath, which meant no Friday shows. He has since changed his stance on both, arriving on stage looking more like a Southern California surfer; the sound, however, was unchanged and unmistakable. The set opened with the synth heavy electronic track “Coming up Empty” off Undercurrent, his sixth studio album. They immediately switched gears and went reggae with “Black Heart” and “Warrior,” a track off his first album that was popularized on his Live from Stubbs release. The star of the show was in constant motion from the first note, dancing around the stage and engaging the crowd, shooting constant cues and requests to the soundboard. The only time he rested was during a few extended instrumental jams that showed off the musical prowess of his band and really featured the keyboards.Using his voice as an instrument, Matisyahu rejoined the jams by showing off some crazy beatbox skills, which he also incorporated into a number of other tracks. They cranked through songs from his 12-year recording history for an hour and a half before saying a quick and muted prayer, throwing up a peace sign and leaving the stage. The crowd erupted in cheers, demanding an encore. After a good five minutes of screaming, clapping and stomping, Matisyahu and crew came back out for another solid 30 minute set before calling it at precisely midnight. Los Angeles-based funk band Orgone returned to electrify the Wild Buffalo stage Feb. 1, joined by opener Dirty Revival, a soulful rock ensemble from Portland. The show started off with a bang as Dirty Revival’s powerhouse vocalist, Sarah Clarke swiftly commanded the audience’s attention with her potent vocal range and hypnotic stage presence. The dance floor was half full when the set began, but not for long. The band, which includes M.C. and guitarist Evan “evv’n’flo” Simko, Terry Drysdale on drums, Karl Ludwigsen on keyboards, Jon Shaw on bass, Chris Hardin on tenor sax, and Jon Clay on trumpet, consistently kept the crowd swaying to their danceable setlist. Clarke retreated to the side of the stage at one point, as the band played an extensive instrumental set showcasing their individual chops, while she grooved along in the background. Dirty Revival’s overall sound seamlessly mixed elements of hip hop, soul, funk, and rock, playing original tracks off their self-titled album, and a new single called “So Cold.” One of the peak moments of the night was when a familiar guitar riff echoed through the room, and Clarke belted out the high notes of “Closer” by Nine Inch Nails. The band ended up sticking around to see the rest of the show, and I thanked them in passing for their stellar performance as they headed to the bar. The crowd was fully hyped by the time Orgone went on. The legendary soul funk explosion that is Orgone hit the stage and performed a dynamic set with a mix of their classics from nearly two decades together, and a few new tracks off of their latest album Undercover Mixtape. Even the wallflowers in the room couldn’t help but dance to the funkadelic beats under the orbit of the disco ball. There were no lulls in the show as each song smoothly transitioned into the next, and the dance floor stayed packed the entire night. The band’s energetic set lasted until about 1 a.m, after an uproarious request by the crowd for an encore. The show made for a more eventful Thursday night than I’m used to as a busy college student. I left feeling rejuvenated after some much needed vitamin soul. The Friend Zone definitely felt equally welcoming as going to a friend’s house. I ran into the Wednesdays when first walking in and was immediately warmly greeted. Sadly, I missed Great Snakes, so Supermoon was in the process of setting up by carrying their instruments through the kitchen. The residents were handling the mini merch table for Supermoon in the kitchen and also welcomed guests as they came in. Their kindness and attentiveness also really helped the overall event feel very comfortable. I could feel the excitement moving into the living room—full of people’s laughter and enthusiastic chatter. All show goers were on the same page; the next two bands were both full of amazing talent and passion. Supermoon quickly halted the conversations around the house and summoned everyone to come by the stage. The living room quickly filled wall to wall, showing how large this crowd was. The residents climbed up on their couch to dance, film the performance, and see over the sea of dancing people. Each member of Supermoon appeared serene—they were in a trance that made the music the only thing relevant in that moment. Although the band’s body language was relaxed, the energy in their music didn’t keep the room still. Most of the people in the room kept jumping or swaying until the end of the set. They perfectly captured their genre—“moody pop,” with their guitars sounding almost ambient and melancholic. The upbeat drums, bass, and surfer-esque quality in the guitar balanced out the somberness by giving it a fun beat to dance to. Bellingham’s The Wednesdays came on next and immediately wowed the crowd with their confident stage presence. Their stuff is excellent on record, and really shows in their live performances. This particular performance had a good mix of some of their previous goods (“Y.F.M.U.,” “State of Nature,” “Sad Waitress”) and some new material. Mars’s drumming was mind blowing and never missed a beat. Maddy’s airy voice and guitar playing was the perfect contrast to Vanessa’s booming voice and guitar. Although their tones were both very different in sound, their deliveries were equally heartfelt. Kayla’s bass had a subtle jazz tone that helped every element melt together into a powerful unity. What really made the performance incredible was how the Wednesdays had so much fun playing their music and really fed off of audience reactions. Each member performed with more energy and passion when they noticed people dancing and singing along. They know how to have a good time playing with each other and also how to make it a good time for everyone—they joked around in between sets, screamed, and danced along to the beat. The Wednesdays ended the set with one of their most invigorating songs, “I Don’t Want Any of It.” Each standing member turned around, backs to the audience cueing the strings. After Mars drummed a few beats, Maddy turned around. Vanessa followed the same pattern and turned after the drum cue. Kayla, kneeling on the floor, turned around and gave the audience a sassy and bold smile. Every member screamed in unison and got the crowd rowdy as they shifted into the first lines. Overall, this show had such a vibrant energy from start to finish. I came in feeling thrilled for what I was about to see and left blown away by each performance. The Friend Zone organized and delivered an unforgettable show, just as uplifting as hanging out with a friend.